Allegro MicroSystems has released a fully integrated, small form factor, power monitoring IC with reinforced voltage isolation. Allegro’s ACS724 and ACS711 Current Sensor ICs are commonly used in internet connected power outlets and other IOT devices. 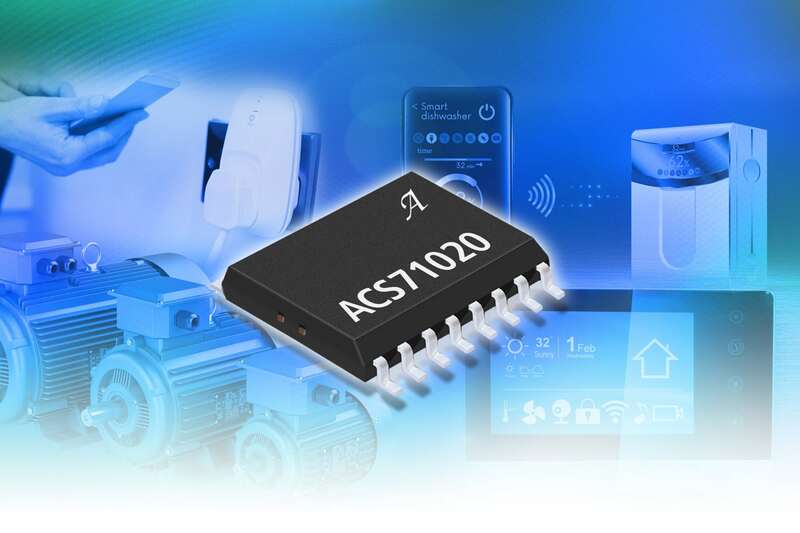 The ACS71020 improves upon these popular ICs by including power sensing functions and by eliminating power and isolation components that would otherwise increase the cost and the size of customer systems. The ACS71020 IC builds upon Allegro’s innovative Hall-effect current sensor IC technology by adding line voltage sensing (to voltage levels > 500 VRMS) and a dedicated metrology engine that digitally calculates detected power levels. This enables the first power monitor IC that can be powered from the same voltage supply as the system microprocessor, without needing digital isolators or multiple power supplies. The device is also housed in a single SOIC-16 wide body package that provides a reinforced isolation rating up to 517 Vrms. This monolithic IC provides makes it simple to add power monitoring to any AC or DC powered device. The ACS71020 current sensor IC is programmed at Allegro for optimised accuracy measurement to either +/-15, +/-30, or +/-90 A. This entry was posted in Europe, Global, North America, On Ticker, Semiconductors, Semiconductors, Semiconductors, top articles, UK. Bookmark the permalink. ← Why buy a fan when you can purchase a cost-saving complete assembly?